Vicki Van Vynckt’s paintings are available directly from the artist and from galleries that carry her work. Unless otherwise noted, all paintings are oil on canvas. Painting sizes range from 8 x 10 inches (203 x 254mm) to 30 x 48 inches (762 x 1219mm) and the price ranges from $250 to $1800 USD, depending on size. Some paintings include frames (although you can have the frame removed if you prefer to frame it yourself). Others are on gallery wrap canvas. Please contact Vicki for more information. Fine art prints of Vicki’s paintings are available at FineArtAmerica.com, which also sells items such as tote bags and greeting cards as well as the standard wall prints. “Constellation–The Stars Shine for Everyone” and “One Beautiful Earth” horses placed in Landrum, SC. as part of the Art of the Horse project. Artist Vicki Van Vynckt has always been inspired by the beauty of nature, particularly sunrises and sunsets. Painting for her is an expression of gratitude for the gifts we have around us. Stop for a moment and take in the magnificence of the changing sky, the sound of bubbling water in a creek, a flower up close, or the glow on the mountain peaks while the sun goes down in the west. There is a deep spirituality to everything we find, and it is as close to us as our heartbeat. Vicki has been creating oil paintings for over 30 years and studied fine art at the University of Southern Indiana. After graduating with a degree in Fine Art, she moved to Minneapolis and took classical drawing and plein-air painting classes through The Atelier, a fine art school that taught nineteenth century French painting and drawing techniques. Vicki soon began teaching oil painting classes through adult community education, as well as out of her studio. She has exhibited her work in over 60 exhibitions. 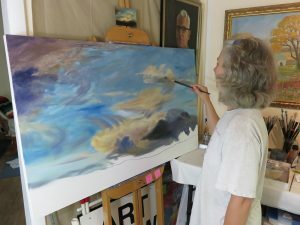 In 2004, she and her husband moved to Santa Fe, New Mexico, where she began painting her “Above the Horizon” series of large sky paintings of the beautiful sunsets of the high desert. In 2010, she made North Carolina her home. She continues to paint skyscapes, landscapes, and dreamscapes. Recently she has expanded her work to include 3D objects, such as the horses she painted for the Art of the Horse project in Landrum, South Carolina. 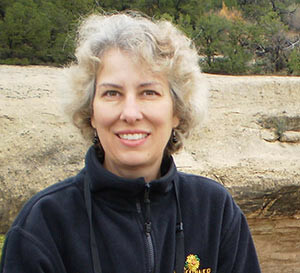 Vicki is currently represented by galleries in North Carolina and New Mexico. Her paintings hang in private collections throughout the United States. Read more about galleries and exhibits of her work. Contact Vicki for more information about her paintings (which can be shipped anywhere) or possible commissions. Vicki teaches classes at Isothermal Community College. She helps each student on an individual basis. Previous drawing experience is helpful. Class size is limited, so sign up early. Materials list will be provided.